I've loved The Body Shop for a long time. To this day I've yet to find a product that makes my skin feel as good as their famous body butters do, and I'm always intrigued by their new launches. 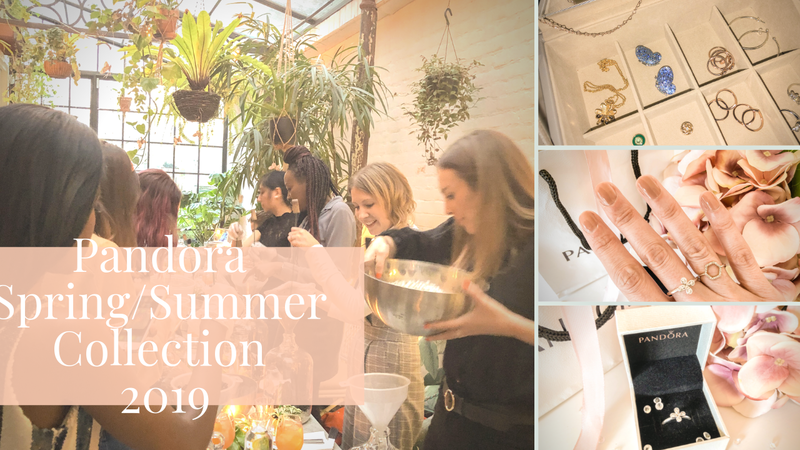 In recent years I think they've gone from strength to strength, and my list of new things I want to try from them - the Vitamin C skincare, the Spa of the World range - only seems to get longer. So when I got the chance to review one of their Christmas gift sets, I jumped at it. 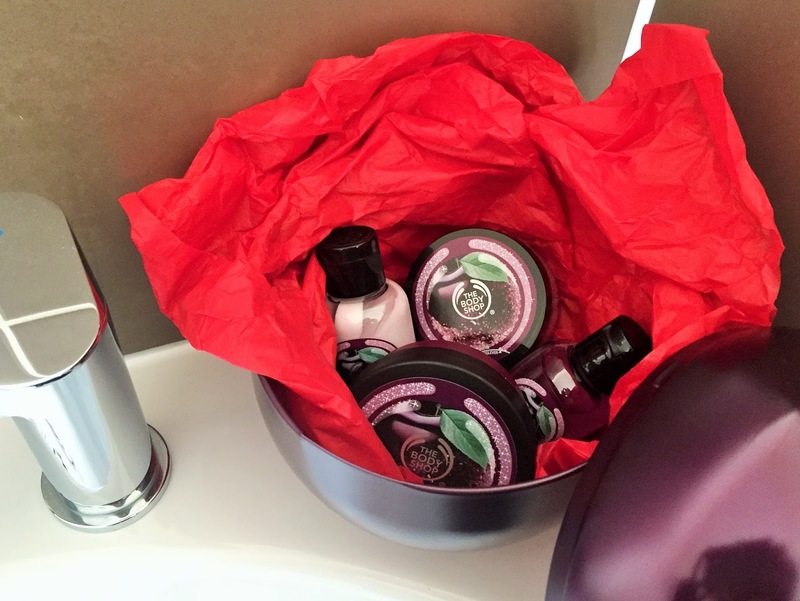 I was sent the Frosted Plum Feel Good Tin, which is part of The Body Shop's #FeelSoGood Christmas gift campaign. As the name suggests, it comes in this very cute plum shaped tin, which I think would be so much fun to unwrap on Christmas morning. 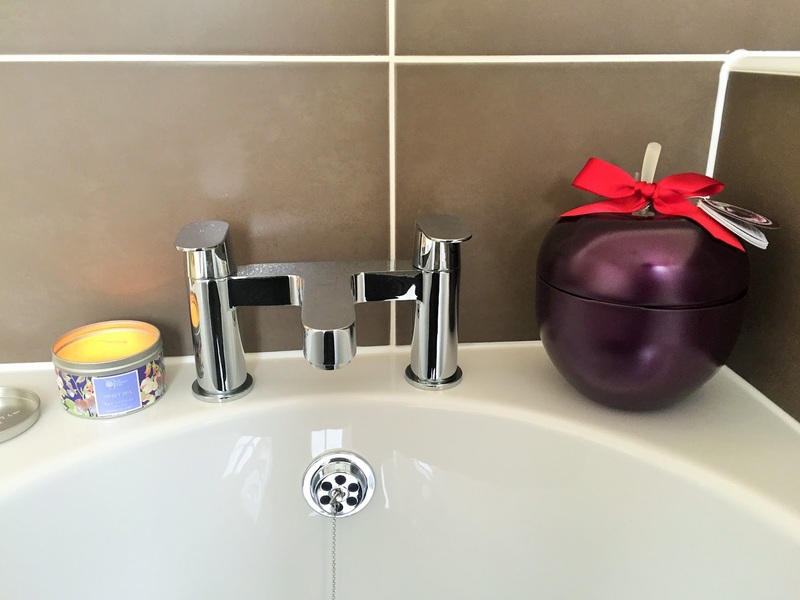 You open up the tin to find four very cute mini products inside - a shower gel, body butter, sugar scrub and shimmer lotion, all in the frosted plum fragrance. The smell is sweet, fruity and good enough to eat (although you probably shouldn't!) I usually favour floral or woody fragrances, but I love this. It basically makes you smell like the Sugar Plum Fairy, and what girl doesn't want that? Especially at Christmas! The shower gel is very light, foams up nicely and of course leaves you smelling divine. 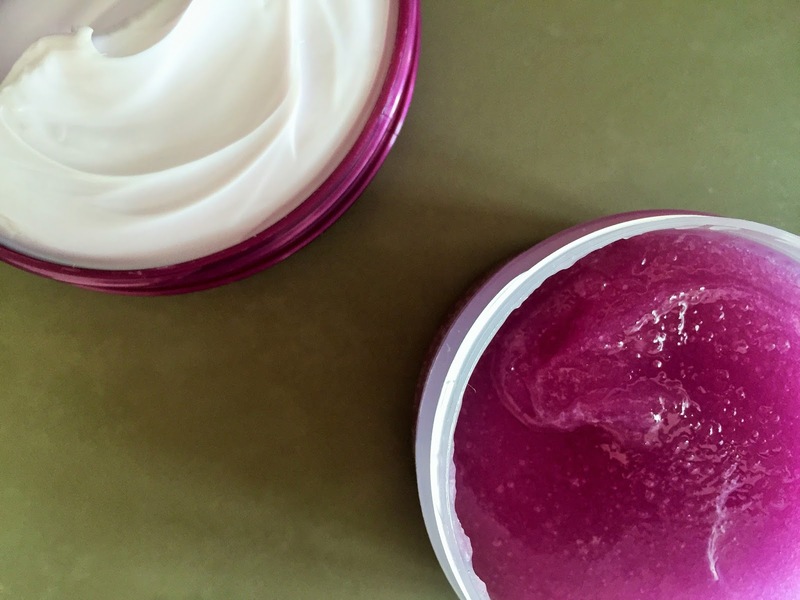 I normally prefer a shower cream as I feel they're more nourishing for my skin, but when you have a rich body butter to put on afterwards, it doesn't really matter as much. 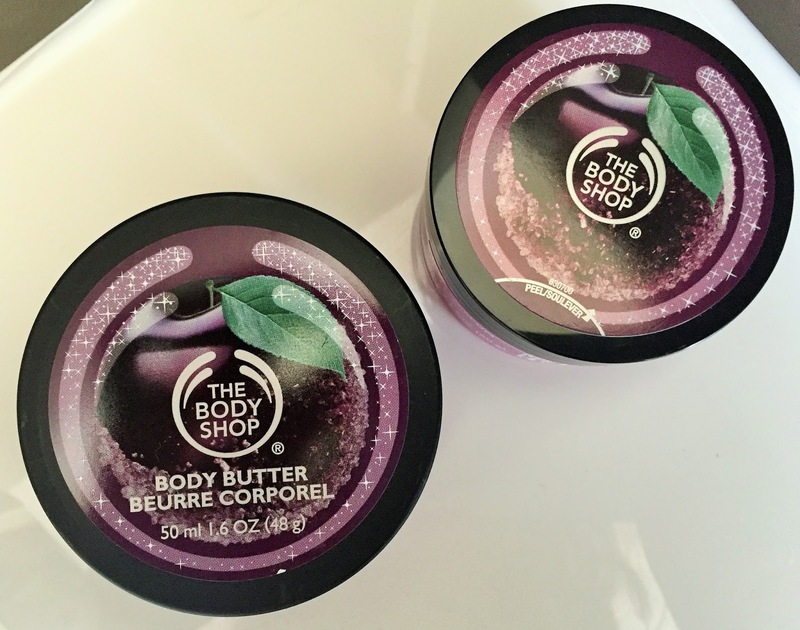 The stars of the show for me are definitely the sugar scrub and body butter. Both feel wonderful to use and have the same amazing scent, and it's these kind of products that I feel The Body Shop just excels at. The combination of the two leaves my skin feeling silky smooth and deeply moisturised. The body butter in particular is so rich and nourishing. I've said it before and I'll say it again - nothing makes my skin feel as soft as these products do! 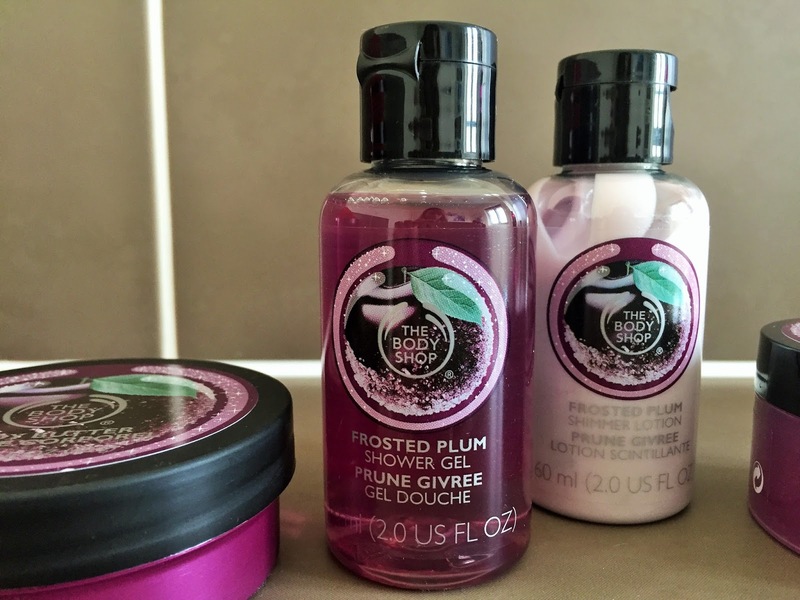 In addition to these three staple products, you also get the frosted plum shimmer lotion. Perfect for Christmas parties, this has a subtle, silvery sheen to it when you rub it in, which gives a lovely healthy glow to the skin. You can kinda sorta see the effect on my hand in the second photo below, but it comes into its own when you're moving about and catching the light. As I said, lovely to add a little "somethin somethin" to bare arms, legs or shoulders at a festive event. This is a really nice gift set, prettily packaged. Because of the sweet fragrance and cute tin, I'd say it would be the perfect present for a teenage girl, but I also think that anyone who enjoys The Body Shop or body products in general would love to receive it. Will you be giving any Body Shop gift sets this year? And are you hoping to receive one? I rarely give them, but most years I receive on from my mum. They are a great way to experience new releases. Ah I received this set too, it's so lovely isn't it, I adore the scent and TBS always have such cool packaging! I really love the holidays because of the gift sets...companies always seem to put a little extra thought into packaging, which makes it super exciting to buy! WoW!! Body Shop is one of my favorite skincare brands. This gift set looks so cute.. I will be checking this out surely! The Body Shop is always killing it with their packaging, and the holiday sets! I think I would buy it just for the amazing color of that purple scrub haha. It's not often that brands and consistently up their product quality, but I agree, TBS is doing so well! Oh my gosh, that tin is HUGE! Hahah My boyfriend gets so mad when I buy stuff like that because I always insist on reusing the packaging for something weird hahaha Great review and gifting suggestion! I really want to try this sweet scent now! This looks really amazing, especially the packaging makes it a great gift! This set looks so lovely, I really like the packaging, it's so pretty! I have seen so many people raving about this! Great review! What a cute and useful Christmas gift set! Very nice Kate! The body shop Christmas sets are always a hit. I tried the apple one last year and loved it. I love the packaging for this! This looks like a really cute gift set, I must pay a visit to The Body Shop soon to get some gifts! Thanks for sharing. I do love The Body Shop for Christmas gifts! 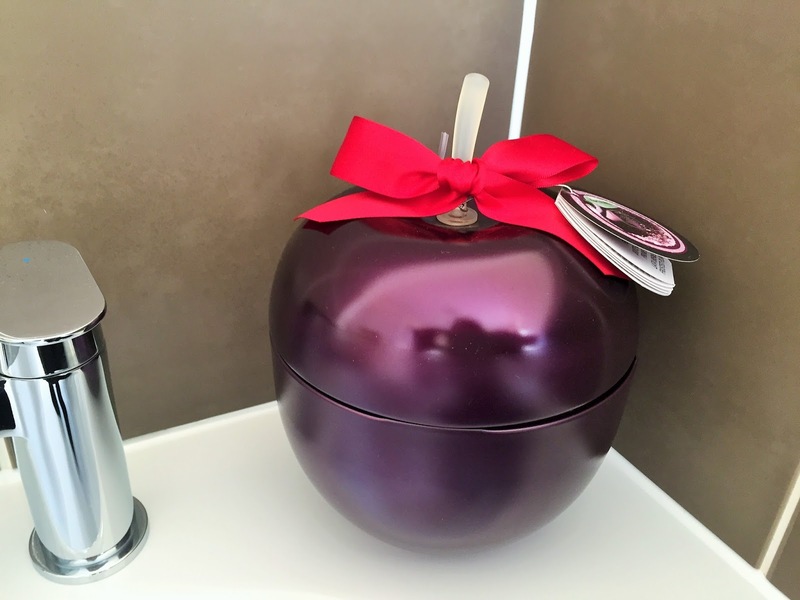 I have heard so many amazing things about this frosted plum range I really need to go and give it a sniff in store and see for myself! I might be amongst the few here but their body butters are one of my least favourite product as I seem to have some weird reaction to them, funny how I can use pretty much everything else they sell though! I bet those smell utterly amazing! I need to head to a store for a sniff! I would be very very veryyy happy to receive this gift set and what a bummer, I didn't notice this set when I was at The Body Shop last weekend or I would have bought it as a gift for my MIL.